Q: We have seen the readout issued by the Chinese side on DPRK Supreme Leader Kim Jong Un's visit to China. What is your comment on the outcomes of this visit? This year marks the 70th anniversary of the establishment of diplomatic relations between China and the DPRK. How do you view the prospect of China-DPRK relations? A: China and the DPRK have both issued readouts on Chairman Kim Jong Un's visit to China. We speak highly of this visit by Chairman Kim Jong Un who came at the beginning of the new year when China and the DPRK is about to usher in the 70th anniversary of the establishment of diplomatic relations. As you have noted, General Secretary and President Xi Jinping had in-depth and cordial meetings and talks with Chairman Kim Jong Un. The two leaders had a thorough exchange of views on bilateral ties and issues of mutual interest and reached important consensus. According to my information, the two sides also briefed each other on their domestic situation. The Communist Party of China (CPC) and the Chinese government attach great importance to the friendly cooperative relations with the DPRK. It is an unswerving policy of the CPC and the Chinese government to maintain, consolidate and develop sound China-DPRK ties. Thanks to the concerted efforts of the two sides, China-DPRK relations have opened a new historic chapter in 2018. 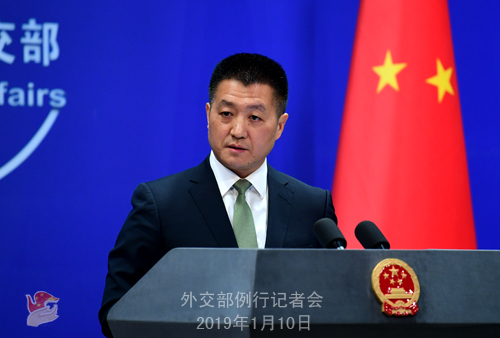 With concrete actions, our two sides have demonstrated the strong vitality of China-DPRK friendship and our firm resolve to jointly move forward the political settlement process of the Korean Peninsula issue. This year marks the 70th anniversary of the establishment of diplomatic relations between China and the DPRK. The Chinese side will work with the DPRK side to maintain high-level exchanges, strengthen strategic communication, and deepen practical cooperation, so as to move forward bilateral ties in the new era, continuously advance the political settlement process of the Korean Peninsula issue, deliver greater benefits to the two peoples, and contribute to peace, stability, development and prosperity of the region and beyond. Q: According to the KCNA report, DPRK Supreme Leader Kim Jong Un has invited President Xi Jinping to visit Pyongyang. When will President Xi visit the DPRK? A: China and the DPRK have the tradition of maintaining high-level exchanges which have been playing an important role in leading and promoting the development of bilateral ties. We would like to strengthen high-level interactions, deepen strategic communication, and expand exchanges and cooperation with the DPRK side. We will timely issue relevant information when we have it. Q: An editorial published yesterday by the Chinese Ambassador to Canada Lu Shaye has got a lot of attention. Ambassador Lu refers to China's arresting two Canadian citizens as retaliation for Canada's detention of Meng Wanzhou and also describes the arrest as China's self-defense. Is this deemed admission that China's arrest of the two Canadians is an act of revenge? A: I hope that you can make an accurate reading and understanding of Ambassador Lu Shaye's article. If you can read the Chinese language, I suggest you read it in the original and avoid being influenced by the distortion and extension made by some media reports on Ambassador Lu Shaye's article. 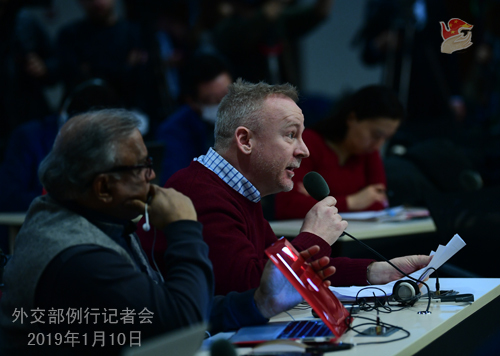 As for the Meng Wanzhou case, we have repeated China's position many times. The Canadian side, clearly knowing that Ms. Meng Wanzhou violated no Canadian laws, went ahead with its unjustifiable and wrongful detention of Ms. Meng Wanzhou just at the beck and call of the US side. 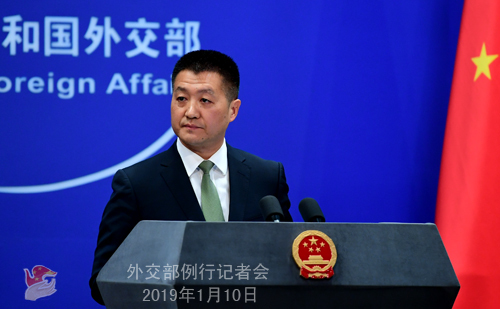 The Chinese people have expressed strong indignation over this case and we have also asked the Canadian side to immediately correct its mistake and release Ms. Meng Wanzhou. As for the two Canadians, the Chinese side has publicly stated that they were taken compulsory measures in accordance with the law for involvement in activities that endanger China' national security. Q: Could you confirm President Xi Jinping has indeed accepted Kim Jong Un's invitation to visit Pyongyang? According to the KCNA report, President Xi Jinping had such invitation in March last year. If so, why haven't he visited yet? A: Like I said just now, the two Parties and two states have the tradition of maintaining high-level exchanges which have been playing an important role in leading and promoting the development of bilateral ties. Please stay patient and we will timely issue relevant information when we have it. Q: It is reported that Tesla officially kicked off the construction of its first overseas factory in Shanghai. Tesla's CEO Elon Musk said yesterday that China's development speed and efficiency are impressive. Tesla will strive to build the Shanghai factory into one of the most advanced factories in the world to achieve mutual benefit and win-win results. He also said that China's reform and opening-up has been backed up by solid measures and in the long run, he is very optimistic about China's future. What is your comment on such upbeat remarks? A: I have noted relevant reports. As you may have already noted, Premier Li Keqiang met with CEO Musk yesterday afternoon. The Tesla Shanghai plant is the first wholly foreign-owned project after China scrapped the equity cap for foreign capital in the new energy vehicles sector. We congratulate the kick-off of the project construction. According to what I learned from the media reports, it only took Tesla about six months to go through signing the contract, concluding the land deal and officially starting construction. I guess that is one reason Mr. Musk is so pleased and thrilled. It fully demonstrates that China's opening-up policies are being steadily advanced. It also shows that many foreign companies have confidence in China's commitment to undertaking further reform and opening-up and in the growth prospects of China's economy. In the past 40 years of reform and opening-up, flows after flows of foreign companies have entered the Chinese market and helped with China's reform and opening-up process while sharing the dividends of China's economic development. China will adhere to the opening-up strategy of mutual benefit and win-win results. We welcome more foreign companies to take an active part in China's new round of high-level opening-up and continue to share the opportunities brought by China's development. Q: There are media reports that the Norwegian government is considering whether to exclude Huawei from its 5G network following the steps of other Western nations. What is China's comment on this? Do you think this would endanger the conclusion of a free trade deal between the two countries? A: I do not want to, and it is inappropriate for me to comment on such reports, because it is unfair to critique the relevant country's government policy solely based on some media reports which simply parrot others' stories. Maybe you need to seek clarification from the government of the country mentioned in the reports on what their official position is. In principle, the Chinese government always encourages Chinese companies to comply with the laws and regulations of the regions and countries where they operate in as well as commercial rules. Meanwhile, we also request other countries to accord unbiased and equal treatment to Chinese enterprises. The second half of your question actually highlighted a principle, which is that unbiased and equal treatments are two-way. I don't think it will be good news for any economy if such a balance is thrown off. Q: There is an American sportswear company that has decided to stop sourcing their products from China because they asserted that the products were made by "workers" held in one of the education and training centers in Xinjiang. Do you have any comment on that? A: Do you know the name of this company? Journalist adds: It is called Badger Sportswear. It makes sportswear for colleges. A: In principle, we have no comment on the production or business of any enterprise. However, if this company as mentioned in the Associated Press reports cut off its trade dealings with China based on wrong information, then I believe it is such a pity for this company. I want to stress that first, China has abolished the reeducation through labor system. Xinjiang's vocational skills and education training is totally different from the "forced labor" alleged by some parties. Second, Chairman Shohrat Zakir of the government of the Xinjiang Uyghur Autonomous Region already gave a detailed briefing on the conditions of Xinjiang's vocational skills and education training programs. You can check on that.